Deborah Linton, Bonnie Carr, and Kathy Clinton share their stories about transitioning from one facility to another. Nately Alvarez and Lauren Eversole talk about Extended School Year options for students in Special Education. David Boyer and Molly Paris talk about accessibility issues in Florida prisons. Selina O'Shannon and Nately Alvarez provide information and tips for successfully navigating the Florida special education system. Judy Silverstein and Carol Stachurski discuss Special Needs Shelters and how they help when disaster strikes. Mark Miller of Interactive Accessibility discusses how our websites and documents can be made accessible for people with disabilities. An interview with John Finch, Director of ABLE United, a new savings and investment option for persons with disabilities in Florida. 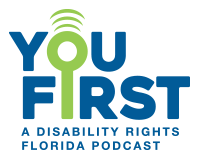 This episode provides an interesting and informative look into different experiences persons with disabilities have had while voting in Florida. Floridians with disabilities should start preparing now to vote in the upcoming election. Floridians are entitled to resources and assistance when voting. This episode will discuss the services and resources available to voters.